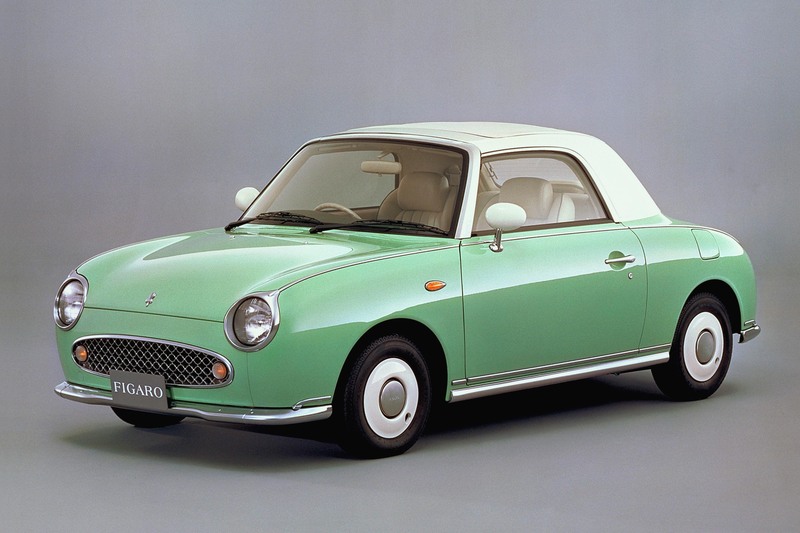 The Figaro was introduced at the 1989 Tokyo Motor Show under the slogan "Back to the Future". It was built by a Nissan special projects group called Pike Factory, who also produced other niche automobiles such as the Be-1, Pao and S-Cargo. Only four colours were available: Topaz Mist, Emerald Green, Pale Aqua and Lapis Grey. The least popular was Topaz Mist, which now has become the most sought-after version. The Figaro was equipped with leather seats, air conditioning, CD player and a retractable roof. It was designed by Shoji Takahashi, who won a design competition with the car. Only 8,000 were originally available with an additional 12,000 added to production numbers to meet demand. * Genuine leather seats standard equipment. * Low mount head rest for classic appearance. * Synthetic leather piping is used for the prevention of leather fatigue. * High quality paint on interior and exterior. o External design completely hidden in trunk. o Equipped with a double lock and warning buzzer as a safety feature. o Secondary hood latch designed so the hood should not open while driving or by accidental activation. * Rear window defroster on glass. * Flush mount apron and flush mount fender. * Fiber glass resin material is used with an outer gel coat. * Resulting in durable low maintenance body components. * Fluoroplastic paint is used. * There was a limited release of the Figaro to 20,000 in the whole country. * By the end of August 1991 the car was divided into three portions. * The sold form was taken. * Half seat cover (one knitting ..silver gray.. race part.) gray & orange and suede. preparing. Nekur forumā neatradu info par šo auto. Cik papētiju, tad tas ir JDM. Ir bijis arī turbo. Vel vienu pardod par 700000 jenam, cik tas ir Ls ? un 700 000 jēnas ir apmēram 3010 Ls. a vinji ar pareizo stuuri vispaar ir?? ?